One report for each [Main demographic]. Summary questions are automatic groupings of questions of the same type from the same page, assumed to be a shared topic, as well as matrix questions. 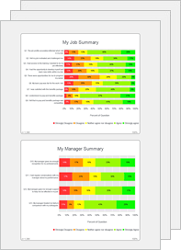 This style shows the distribution of responses for all questions in each such summary as a chart. Useful for comparing the details of responses across questions in a summary.